Project Fiver : Mission Accomplished!! It is done! After years of working to make it happen, and having to keep our mouths shut about it for a year until the film came out, The Triumphant Tale of Project Fiver coming to fruition can now be told!! Melissa was flown to New Zealand last year to be part of THE HOBBIT. 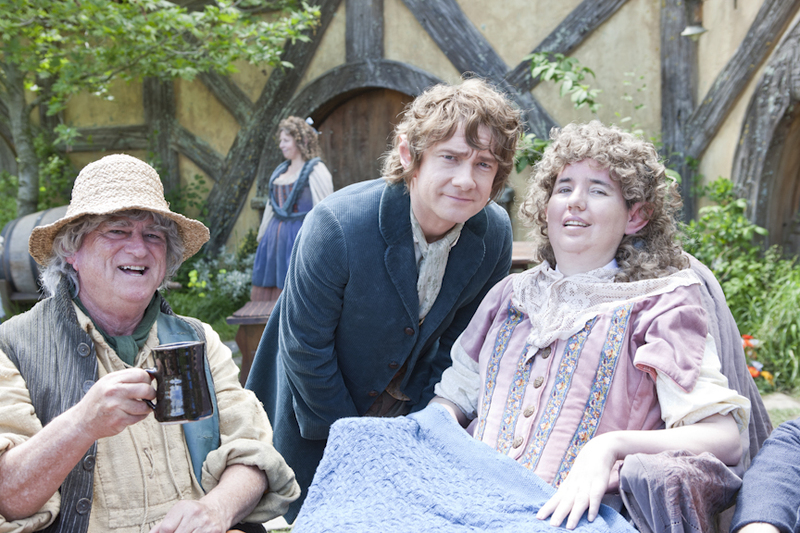 She even got to meet the film's Bilbo Baggins -Martin Freeman! Read the story at the link, it's a pretty thorough account of what happened. Again, I cannot thank you, and the internet as a whole, enough for making this happen. People told us that it was a nice gesture, but petitions like this never really ACCOMPLISHED anything. But We had faith, and you all had faith, that this petition would be the exception. And it was. Thank you all so much for helping me give this incredible gift to Melissa, it is something I could never could have done all by myself. All of you have earned a share of the accomplishment as well, for your part in it. So go see THE HOBBIT in theaters, and next year, when they release the Extended Edition DVD, Look for Melissa and I in the Market scene in front of the Green Dragon Inn!